A ruddy amber American Strong clocking in at 7.7% abv. Grapefruit and stone fruit hop aroma and character are balanced by a rich red malt backbone. A precise blend of 7 hops go into the brewing and dry hopping process including Nelson Sauvin, Mosaic, Horizon, Palisade, Citra, Willamette, & Columbus. From Flannery O'Connor to Iron Maiden the Seventh Son of a Seventh Son is embedded in American culture as a powerful harbinger of good fortune; what better name for our flagship ale? *Pairs well with strong flavors found in roasted meats and root vegetables and works well with Double Gloucester or other moderately aged cheeses. A toasty brown ale with a round full mouthfeel and a pleasant 5.25% abv. Stone Fort offers accessible English ale character and a smooth blend of light roast coffee, cocoa, leather and biscuit flavors. 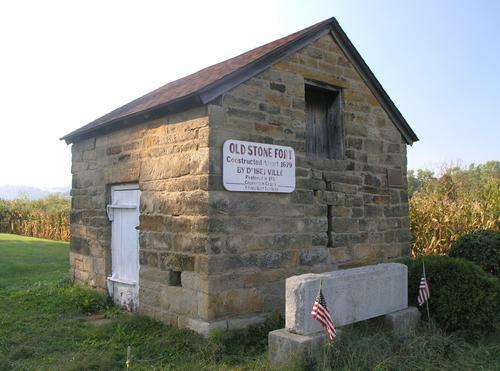 The Old Stone fort overlooks the Tuscarawas river in Coshocton county and constructed in 1679 is thought to be Ohio's oldest building; an appropriate name for a solid Brown ale with the hallmarks of this timeless style. A pale golden ale that is both super crisp and super hop forward with a refreshing mouthfeel and a summer friendly 6% abv. Mosaic & simcoe hops lend a note of blueberry and fragrant pine to a pleasingly bitter dandelion finish. We wanted the hops to be the star in this flagship ale taking its name from both the hop plant, Humulus Lupulus, and its light color and cloud-like feel, nimbus. This deep bronze double IPA starts with large additions of Amarillo and Horizon hops in the kettle then settles back for several months of aging on Cherrywood and Oak. Following its time spent on wood we finished Woodwolf with a generous amount of Citra, Amarillo and Centennial in the dry hop. Bitter citrus peaks out from behind a rich malt backdrop featuring faint vanilla and touches of classic American Oak. The hallucinatory legends of the Slavic forest witch, Baba Yaga, get a Baltic reinterpretation for this special bottle. The mellow roast and deep fruit flavors of our Baltic porter are enhanced with extra complexity by a long rest on birch and oak staves. Ein rauchig doppelsticke Altbier. We enriched this double-strength old-school German-style ale with a blend of smoked malts and a light touch of noble dry hop. Rich, savory malt sweetness is balanced by a solid hop bitterness. Ich habe den Schlüssel zum Einäugigen Willy. A kitchen-sink blend of various malts and hops found laying around the brewery lead to this unrepeatable dark ale. Light roast, sweet caramel and bitter spice. We have no idea what this beer is, enjoy! A 5% abv session version of our regular Black Sheep Robust Stout brewed especially for the onset of patio season. Dry hopped with Northern brewer and Willamette for a unique aroma, with flavors of dark unsweetened bakers chocolate fading into a lingering carob and licorice finish.